We install soakaways both for foul and storm drainage requirements. We can carry out percolation testing requiremnents for consent to discharge. We also install Septic Tanks and Treatment Plants. All installations meet H2 requirements. For all your drainage soakaway requirements. From patio and driveway/car park rainwater drainage to gutter drainage sytems. Water is not being taken away from the house when it rains. I have a large roof that drains to soak aways that are not working. 21:06 26/06/14 Keith and his team did a 1st class job. He was reliable and knowledgeable and prepared to work with us, accommodating our changing brief with a smile on his face. He paid attention to detail and delivered just what we wanted at a good price. Walkahampton Drainage for drainage soakaways. 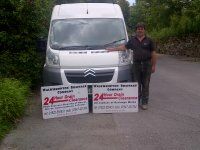 We offer 24 hour emergency service both for drainage repairs and blockage clearance. Blocked Drains Plymouth and Blocked drains Tavistock. 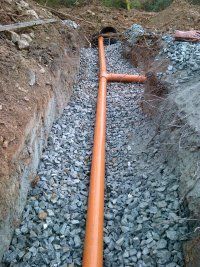 For drainage installation and drainage repairs, we offer a full drainage service. For all aspects of drainage works and Building and Grounds Maintenance. Ground Works are undertaken to offer a full service to you. For your Soakaway Installation Requirements please Contact Keith on 07547 421704 or 01822 855451.